GoodSense® Naproxen Sodium Caplets, 220 mg (Capsule-Shaped Tablets) temporarily relieves minor aches and pains due to minor pain of arthritis, muscular aches, backache, menstrual cramps, headache, toothache, and the common cold, and temporarily reduces fever. Compare to Aleve® Caplets Active Ingredient. 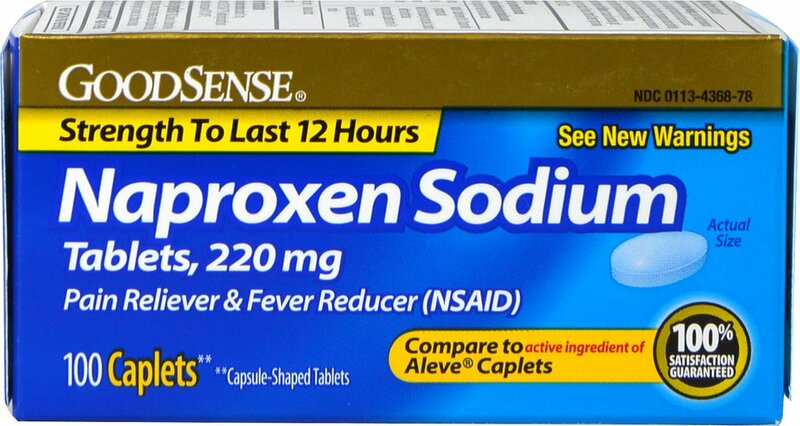 GoodSense® Naproxen Sodium Tablets, 220 mg (Capsule-Shaped Tablets) active ingredient is 220 mg of Naproxen Sodium and it may be used as a pain reliever/fever reducer for adults and children 12 years and over.